A relatively new program, the architectural studies degree stresses a liberal arts approach to architectural history and design. The student experience combines architectural history and theory, studio experience, and courses in environmental studies, math, and physics. One goal is to prepare students for master’s-level study in architectural design, but the program also serves as a broad foundation for a number of career paths related to the built environment, like historic preservation, urban design, and city planning. Most graduates of the B.A. in architectural studies program will need to pursue a three- to three–and-a-half-year master of architecture program in order to receive a master of architecture degree to practice architecture and become licensed architects. Growing up in an urban environment, Andreas Jonathan ’14 had never been camping or hiking. But during his first year at Ithaca College, he ended up in the woods at night, blindfolded, finding his way back to campus just by listening. It was all part of the Environmental Sentinels course, an innovative, hands-on learning experience in which students use wilderness awareness and survival skills to learn about local natural history and ecology. “The purpose was to discover what you’re trying to save,” said Jonathan, who started his college career as an environmental studies major before switching to architectural studies. Since then, Brenner said, Jonathan has developed into an impressive scholar on landscape architecture and urban design with a sophisticated understanding of the interface between nature and the built environment. Though he maintains an interest in environmentalism, Jonathan wanted to combine his desire for a sustainable society with his interest in architecture. As cities continue to expand and climate change continues, Jonathan wants to help strike a balance between urban growth and environmentalism. “We’re living in a world that is very quickly urbanizing. There are a lot of mega-cities continuing to grow, and I think cities will be the battleground for sustainability in the future,” Jonathan said. In his four years at IC, Jonathan did just that. 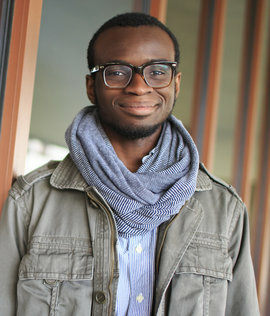 As a sophomore, he secured an internship with the Institute for Urban Design in New York City. He joined the institute’s project team for the Venice International Architecture Biennale, an event where architects and designers from around the world showcase themed designs. The U.S. theme was “spontaneous interventions” — designing to solve urban problems and create new opportunities for the public. The summer before his senior year, Jonathan took part in a month-long academic program at Columbia University’s Graduate School of Architecture in New York City, which included studio visits and lectures by visiting professors. There he was exposed to the kind of work he will be doing as a graduate student. Jonathan started this fall in the University of Pennsylvania’s master of landscape architecture program, where he will be able to foster his passion for both the environment and architecture. “You are thinking about these constructed spaces that are designed and built to meet certain needs. But at the same time, you are thinking about them in terms of how they’ll change,” Jonathan said. Jonathan will be the first in his family to attend graduate school. In fact, neither of his parents — who emigrated with a five-year old Jonathan from Nigeria to America — finished college. The faculty in the art history department awarded him the 2014 Art History Prize at Ithaca College, recognizing him for his outstanding achievement and citizenship as an architectural studies major.